Love this dish. I used thighs the first time then tried chicken breast. Stay with thighs. Much better. Tonight I made the Nana bread. 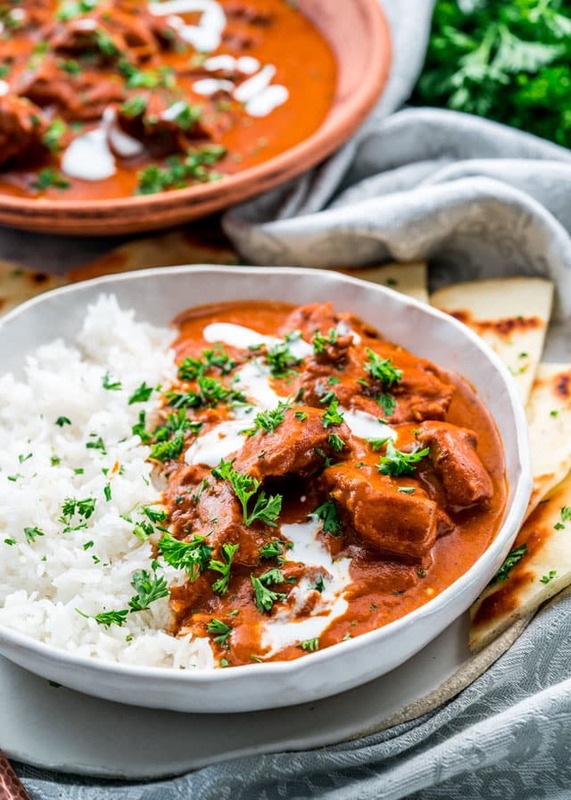 I used to make butter chicken in the crockpot but we just found our favorite recipe and it’s so much quicker!! Thank you for posting it! Thank you, this recipe is excellent and I make it regularly! 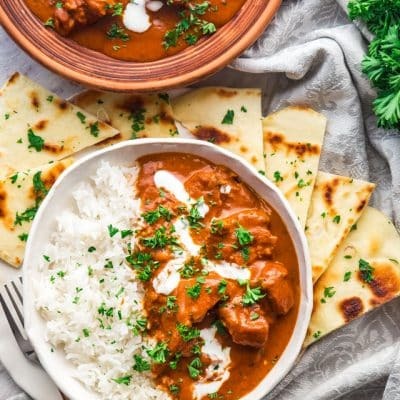 I tried so many different instant pot recipes for butter chicken and they were just okay – I am so happy that I kept looking and found it. I love hearing this, so glad you liked it! 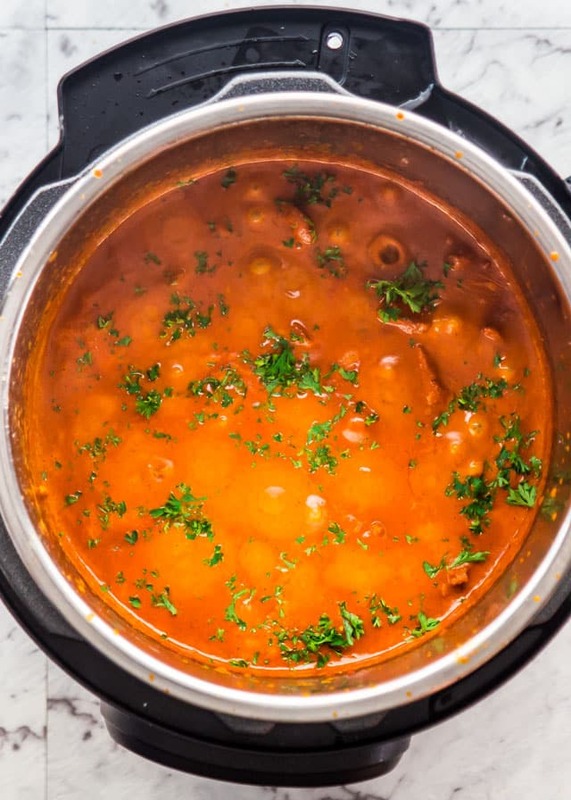 I’ve made this in a slow cooker several times and I’m so excited I finally get to make it in an Instant Pot! Absolutely! This recipe freezes very well. Just made this tonight. Used whole on the bone chicken thighs. It was amazing!! So easy and I already had most ingredients. My Instant pot doesn’t have a poultry button so I cooked it on manual for 15 min and let the natural steam release while I made the rice and grilled the naan. Thanks for the recipe! Delicious! This was a definite winner in our house. The kids love it too. Can I use the same amount of ingredients in an 8qt? This recipe is AMAZING!!! I’ve made it 2 times and it doesn’t disappoint!!! Better than going out for Indian food!! Just made this last night with some jasmine rice, Dal, and Naan bread and it was fantastic. I have an 8 quart instant pot so I just added a little more water to completely cover the chicken and it turned out perfect. I absolutely love good Indian food so couldn’t wait to try this but was thinking it couldn’t possibly be as good as the butter chicken at my favorite restaurant. I was pleasantly surprised that it was, maybe even a bit better. Knowing I can have this made for my family in no time is such a bonus, especially since good meals have been much more difficult around here with the new baby. This dish will be a regular in our house from now on and I can’t wait to make it for family over the holiday. Thank you so much for this recipe!! I’m so so happy to hear this! 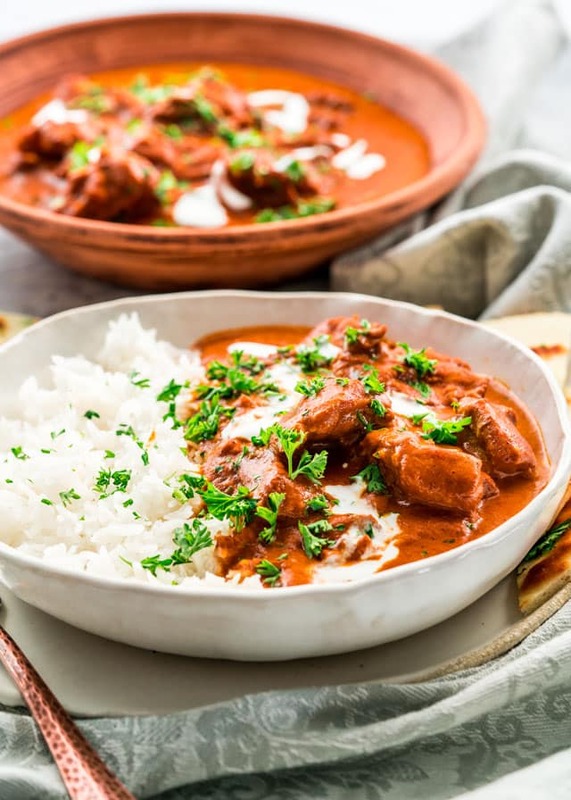 You know this is a dish we love, and I always used to order it whenever we went to an Indian restaurant, but now we never go anymore because I make it at home and it’s so easy to make. So happy you guys like it! I am tempted to make this for guests this weekend. I was hoping I can get some suggested sides to create a dinner menu. Make a batch of naan and serve with roasted veggies. Enjoy! Sounds so delish! 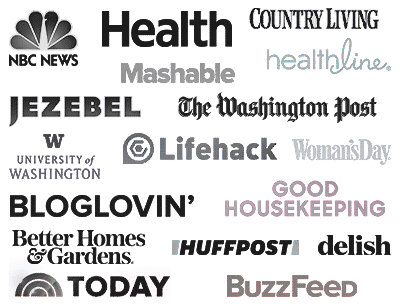 Due to my lack of planning…..how would I adjust the cooking time using frozen chick thighs? 25 minutes will be more than enough for frozen chicken thighs. I’ll pop chicken breasts straight from the freezer in my IP for 12 minutes and they’re done. It’s an amazing pot! Thank you so much for this recipe! I went to an Indian restaurant last week and had this butter chicken for the first time. It was so good that I had to try and recreate it. This recipe is a family favorite! 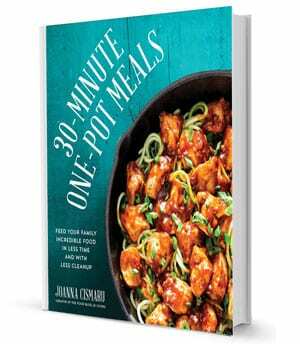 It’s great with jasmine rice, and even MY KIDS love it (who are usually really picky). I’ve tried to make it with white meat, but dark meat is the way to go. Much more tender and doesn’t dry out. Thanks for sharing. We LOVE this recipe! It’s become a regular in our house! So good!! I love this recipe and have eaten it many times! I was wondering if this recipe can also be used in a crockpot/slow cooker or if some changes would be needed. Thanks! Follow all the instructions the exact same, and then cook on low for 4-5 hours. Enjoy! Hi Jo, my husband doesn’t like Indian food so I want to make this for just myself. If I want to cut this recipe in half, should the cooking time be the same? Yes cooking time will be the same! Absolutely amazing!! 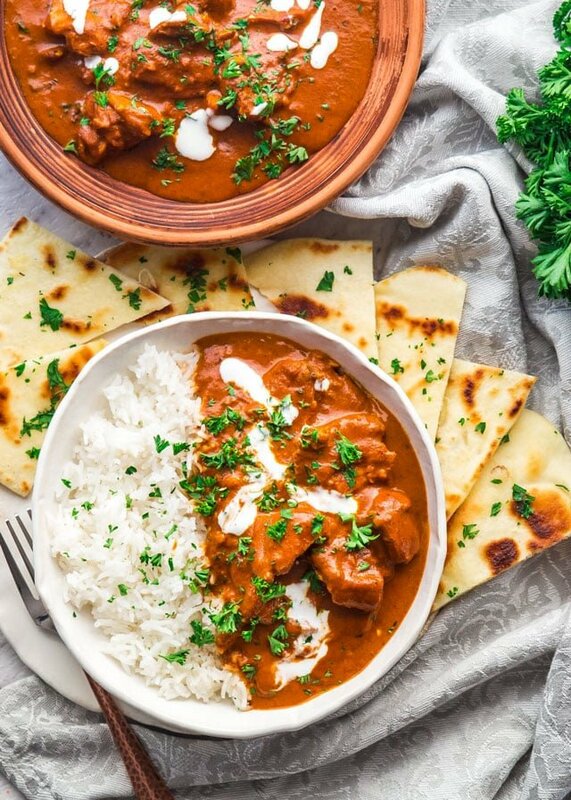 Probably one of the best butter chicken recipes I have ever tasted, let alone made! My dinner guests were raving, thanks so much for the recipe, definitely adding this to the roster! I’m so glad you like it, we make this often too, it’s one of our favorites! I made this recipe for my family it was so easy and quick. The biggest challenge was finding the spice Masal. My family absolutely loved it. The chicken was tender and full of flavor. It will be a regular supper going forward.